During their event today in San Francisco, Apple announced iTunes 10, the latest version of their music software. But they also introduced a big new feature in the app — Ping: a social network for music. 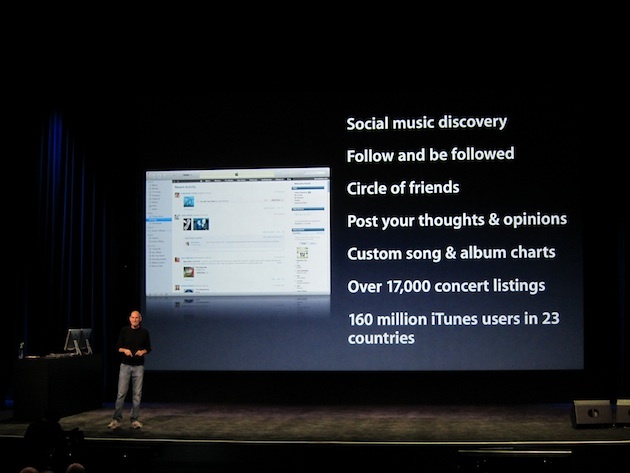 It’s like “Facebook and Twitter meet iTunes,” Jobs says. “But it’s not Facebook, it’s not Twitter,” Jobs is quick to note — “it’s a social network all about music.” And guess what? It has 160 million users in 23 countries built in right away (Apple will presumably be opening it up to other iTunes users later). And it’s available on your iPhone and iPod touch — right in the iTunes Store. Jobs notes that this feature is all about discovery. You can follow both artists and your friends. And you can be followed. With it, you get custom song and album charts to discover new music. And you can post your thoughts and opinions about your favorite music. Plus, there are 17,000 concert listing in the network. Last.fm, MySpace Music, etc. — look out. Oh, and another Apple competitor has been doing something similar for a while — Microsoft with Zune. But again, 160 million users out of the box. Ping is available as a part of iTunes 10 — which is available today.